Bob Gatje, an architect who served as a partner of two AIA Gold Medalists and whose work is to be found in half a dozen countries, died on April 1st, 2018 in New York City. He was 90. The cause was a stroke according to Susan R. Witter, his companion and partner of 35 years. Bob worked with Marcel Breuer and Richard Meier as well as his own partnership, Gatje Papachristou Smith, during a career of over 50 years, largely overseas. He is best known for his role in the design of two “monuments of French Modern architecture,” IBM’s La Gaude Research Center, and the ski town of Flaine. In the U.S., he was responsible for the award-winning Broward County Main Library in Fort Lauderdale, Florida. A fellow of the American Institute of Architects, Bob was president of its New York chapter from 1975 to 1976. 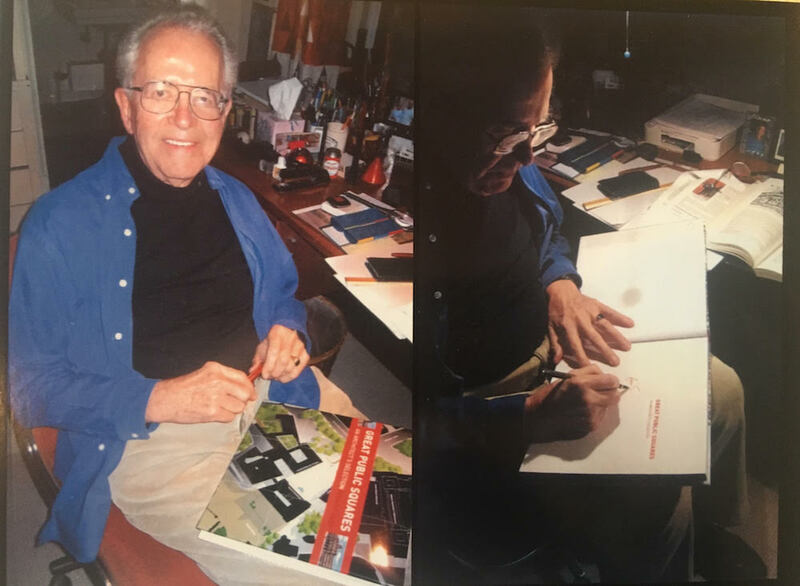 As a student, Bob broke academic records at Brooklyn Tech and Cornell University, where he received his B. Arch in 1951. He served in the U.S. Corps of Engineers and studied at Deep Springs College, an institution to which he returned as Trustee and received its medal in 2008. He was a Fulbright scholar at the Architectural Association (AA) in London from 1951 to 1952, president of Telluride Association, and Trustee of the New York Hall of Science and the Franklin and Eleanor Roosevelt Institute. I first met Bob at Marcel Breuer’s office in 1960, which in those days, along with Ed Barnes and Philip Johnson’s offices, was the place for a young, ambitious architect to work. The office was right above Schrafft’s at 57th Street and 3rd Avenue. Bob and his partners ran the office. Breuer or Lajos, pronounced ‘Laiko’, was not always easily understood, and was often away. Bob was the steady hand in the office, forever patient and in good spirits. I sat between Richard Meier and Paul Korelick, who went on to win the Dublin Library Competition, while in the office. Bob and Breuer made a great team. Bob had an excellent handle on design, with a strong passion for the visual product. His graphic work, as well as the several books he wrote on design, showed this. He was the author of Marcel Breuer: A Memoir, co-written with I.M. Pei, and “Great Public Squares: An Architect’s Selection,” a book that sets international standards for urban space. We remained good friends over the years, as he did with so many others who worked with him over the years. His friendships reached out to many, even outside the world of design. An evening at the Gatje/Witter household was always a broadening experience.